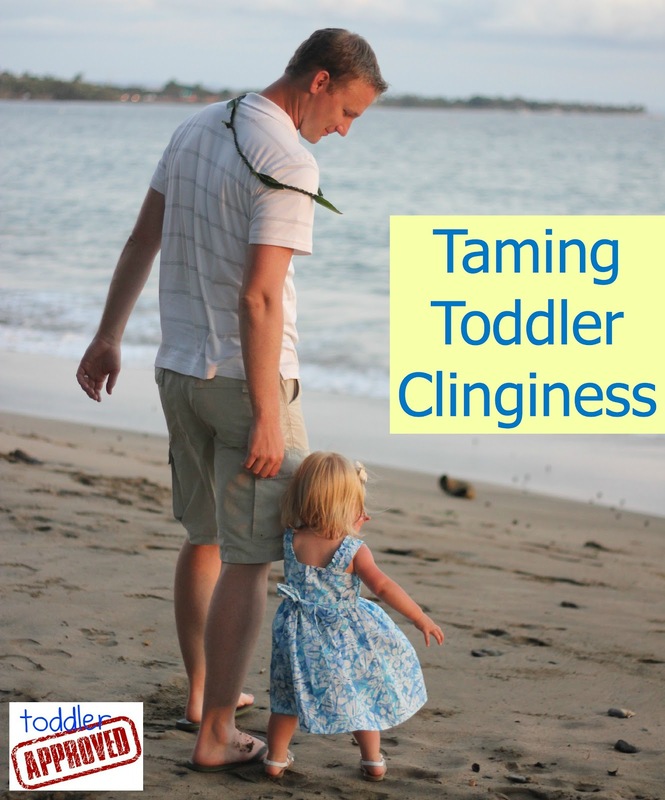 Has your toddler ever gone through a clingy stage? My daughter has been a "momma's girl" since she was a baby, but over the past few months she's reached a whole new level of clinginess. It is exhausting. To be honest with you, I've gotten frustrated more than once about it. A lot of toddlers go through a separation anxiety phase. Over the past few months we've had a lot of changes in our family that have definitely contributed to my daughter's anxiety as well- new babysitters, traveling, meeting new or less familiar relatives, and the news that a new sibling will be arriving soon. I've spent a lot of time reading about toddler clinginess and how to handle it. I am not perfect and don't always remember to use these ideas, but when I do, my daughter definitely responds better and is happier. 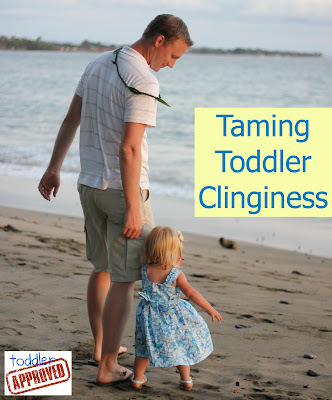 I thought I'd share a few ideas for taming toddler clinginess with you today along with some articles that expound on the suggestions that I am sharing. There are so many great resources out there for parents to check out on this topic! This has been hard for us to do while we have been on vacation for the last few weeks, but we've tried. On our recent trip to Hawaii we had a pretty consistent schedule of breakfast, beach time, lunch, nap, pooltime (or an excursion), early dinner, playtime, and bed. My daughter seemed very relaxed on this trip and willing to spend time with extended family members. She tantrumed less, seemed less worried about me leaving her, and was much happier. 2. Be confident and honest when you leave. I am guilty of sneaking out of the room when my son was little when I left him with a babysitter. With my daughter I have learned that that isn't helpful, though it would be much less painful for my ears! :) Janet Lansbury recommends separating with confidence and letting toddlers know you are leaving. I try and reassure my daughter that I will be back, give her a time frame for when I will be gone, and then when she starts crying as I am leaving (which she always does), I tell her I love her and that I will be back soon. This seems to help. I also need to leave when I tell her I am leaving... and not go back! Prolonging the goodbye makes it worse for her... and if I've forgotten something then sometimes it just gets left. It is not worth hearing the crying again to go back! By being confident and honest, my daughter seems to trust me more and recover quicker after I leave. I am getting better about this one. Janet Lansbury also recommends releasing our expectations or wishes for our children to go off a play without us and enjoy the clinginess instead! I've heard other parents say (and probably also have said this myself), "See, Johnny is playing nicely with the trucks all by himself" or "Look at all of the fun toys over there, you are missing out by sitting here with me..." or something else like that. Janet mentions that pointing out those things can intensify the clinginess. So, I'm learning to embrace the clinginess more. I already adore the kisses and constant hugs I get from my daughter, but I am getting better at sitting down on the floor and stopping what I am doing to give my daughter the emotional attention that she needs. Once her need is met through cuddling, being carried around, or whatever, she is typically more willing to go off and play independently. Pretty soon my arms will be full with another little one and I don't know how much longer my toddler will adore me like she currently does... so I am definitely trying to enjoy the extra cuddles and clinginess more! After all, the dishes and laundry will be around forever! 4. Play games with your child to help them deal with this clinginess challenge. Dr. Laura at AHA Parenting mentioned two funny ways to help kids who are attached to one parent or are super clingy. One of the games is to be super clingy back to your child in a super-exaggerated and silly way. She explains the rest of the details and another activity to try here. When I've tried this is has made me way less frustrated with the clinginess and has resulted in a lot of giggles and fun. 5. Observe independent play more often and interrupt less! When my kids are playing independently I'll sometimes go join in or interrupt and praise them for how they are playing or suggest other activities that they could try. What I don't realize is that I am not helping them build their attention spans or abilities to play independently by doing this. By observing their play and not interrupting, I am allowing them to strengthen their ability to focus. I hate being interrupted, so I should be respectful of them too! The more I interrupt my daughter during play, the more she counts on me to help entertain her, and the less she uses her own imagination and independent play and focusing skills. 6. Encourage childcare giver to comfort and acknowledge feelings, not distract. This post by Abundant Life Children about Honoring the Emotional Child explains this point in greater detail. One other thing I thought was important was teaching a caregiver or spouse to not say, "you're okay" but instead to comfort the child, give hugs, etc. and remind them that mommy will come back soon. Abundant Life Children suggests that "When we distract, we short-circuit her process of feeling the emotion, and we send the message that being okay is more important than feeling integrated." I am still practicing this. I have used techniques of distraction with kids for years, and to be honest, I haven't seen anything negative come from it because I usually do it along with acknowledging the child's feelings and comforting them. Instead of just trying to find a snack to distract or a new toy, I can see the relevance in asking the toddler how you can help and asking if they want a hug or want to be carried or to read a story and cuddle (though not all at the same time :)). I will keep working on this one! 7. Set up some special time just for the two of you! I am absolutely terrible about doing this and I need to get better at it. When my son is at preschool or camps then I use every minute free to run errands with just one kid or do laundry or try and clean my house. When I do set aside thirty minutes to sit with my daughter and play (without interruptions) it is amazing how much more confident she becomes and more willing to play by herself. As the arrival of our new baby approaches, I am going to try and set up some special mommy/daughter date times where my daughter and I can just enjoy being with one another. It is amazing how something that simple can make a toddler so much more emotionally secure. My son always had me all to himself, but my daughter always has to share the attention... it is time for her and I to get some extra time together before her world gets thrown out of whack when her new baby brother arrives! Which of these things do you already do with your clingy toddler? Do you have any other suggestions for me? Hi, i enjoyed your article today. Hope you don't mind i link back to you from my blog. I did too, I saw some positive changing in parenting and accepting where the child was at. Getting down to her level for one, great and the other that works really well with kids is to be with them and having an accepting, peaceful smile coming from you. That accepting peacful smile might produce some safety for the child to discharge their anxiety (emotions) around their stuff. So good counsel going on there. Some good counsel going on here. Getting down with the child to her level, accepting and peaceful smiles will bring safety and security enough for the child to discharge their emotions around their stuff. The discharging should take any where from 5 mins to 1 1/2 hrs, depending on how much stuff is in there. It works wonders. Helps the kids to be more amiable to be with. Good thinking on ur piece. Hai, this article is awesome. Shall try it on my lil angel. My daughter of 1 year and 5 months has a habit of throwing her cups, plate and utensils on the floor as well as banging them on the dining table. She also has the habit of throwing food on the floor once she decides not to continue her meal. It is a lil bit frustrating especially when we go out for dinner. How do i overcome this.